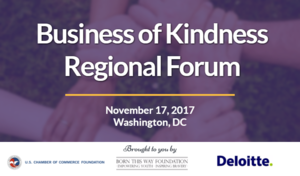 Join the U.S. Chamber of Commerce Foundation, Born this Way Foundation, and Deloitte on November 17, to learn from business leaders, academics, and community partners on why they are championing kindness in the workplace and how you can foster it in yours. What is inclusivity and what are the best practices to achieving it? Kindness is priceless and it makes a powerful impact—together, we can work to put kindness front and center.